This morning we headed out for our Sunday breakfast. Trussardi and I have a tradition that every Sunday we sleep in, enjoy a lovely, filling breakfast and then spend the rest of the day together. Today we went out in our new neighbourhood to enjoy some infamous Parsian crepes. Lucky for us we live right around the corner from several lovely restaurants. 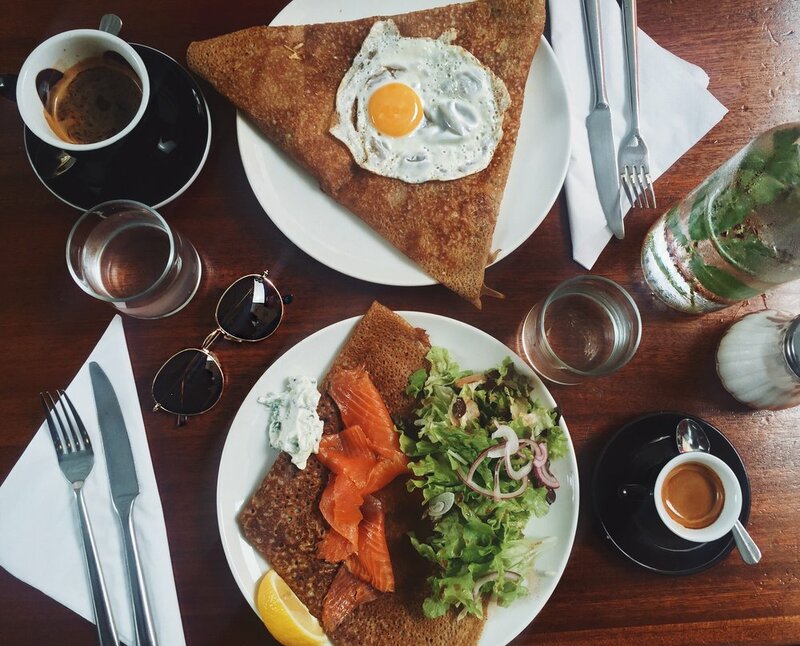 Everyone knows (and if they don't, know they do) that you must eat crepes in Paris. I mean it must be a rule so with that being said we found ourselves at Le Comptoir du Commerce on1 Rue des Petits Carreaux in Paris. Trussardi enjoyed the "C'bon" while I tried the "Sans Arrêtes". We both enjoyed our meals and the wonderful people watching while sitting outside. What we really love about Parisian dining is that we can order our coffees and crepes and not be bothered until we are ready to get the bill. That means we can sit and people watch outside, sipping on our coffee for as long as we want without being interrupted by anyone. I think that is a very big difference between the USA and Europeans. In the USA there is a focus on turnover in restaurants because the more tables turned over the more tips a waiter/waitress can get. In Paris, there is no focus on tipping because restaurants pay their employees livable wages. The french culturally learn to enjoy there food and dining as an experience rather than a "rush to eat". We really enjoy this part of life in Paris and wish it was something Americans would adopt. If you're ever in Paris we do recommend this place!